Colors are in the air. The most colorful and joyful festival is knocking the door. It will be a cheating for your customers if you’re sitting and have not planned anything for them. And if you’ve planned something for your customers, then have you decided how to make them aware of that? Now, thinking as a marketer, Festival days are the golden days for any marketer. All you have to do is to present yourself and your services as brilliant as possible. But the main problem is deciding the way of media through which you can deliver your brilliance. Being a smart marketer you can’t avoid any of the media but concentrating on the best media is a very decisive issue. There is myth flowing nowadays among marketers regarding that “Email Marketing is dead ” and there are no reasons left to invest in it. Trust me, I can give you 10 reasons to prove you wrong and to make you aware that why we should never leave the hands of Email Marketing following some of the useless myth. 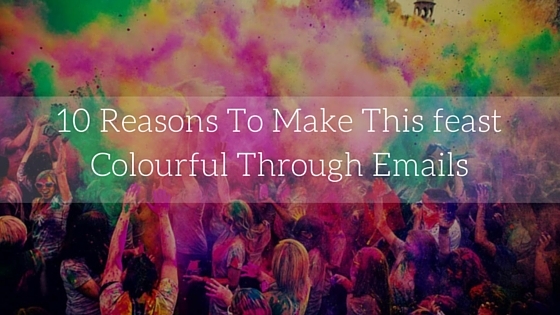 I hope I have given you enough reasons now to not leave the hands of Email Marketing, after all, festivals comes once in a year and enjoy this coming feast with heavy leads by choosing the right direction and holding the right hands.